The topic of today’s episode comes courtesy of my good friend Sarah, who fortunately hasn’t yet had any reason to use this knowledge, but asked me to do an episode on how to help children cope with illness, death, and grief, so she can be ready in case she ever needs it. Dr. Atle Dyregrov joins us from Bergen, Norway. He graduated as a psychologist in 1980 and worked for five years in the Pediatrics department at Haukeland University Hostpital, helping families whose children had died. He also co-founded the Center for Crisis Psychology and served as its general manager for 25 years; he is now its academic director. He has worked particularly extensively with children who have experienced loss and trauma, as well as at the sites of major accidents and disasters both in Norway and abroad, and has written numerous books, book chapters, and research articles on children’s response to death and crises. It turns out that this ended up being a very timely episode for me indeed: you’ll hear in the show that my mum died when I was young. Not even a week after I did this interview, my newly three-year-old daughter was playing with Legos in our living room when she asked – completely out of the blue – “Do you have a mama?” Having done this interview I was well-prepared for a short but straightforward conversation, and was able to shift what would likely have been a very uncomfortable situation for me into something where I felt much more confident in explaining how people’s bodies stop working when they die. Subscribers to my newsletter will recall that we spent last week in Missouri visiting the very same Sarah who requested the episode, and I had given her a summary of the content and told her about my daughter’s question. A couple of days later Sarah and my daughter found a dead bug on a playground and Sarah said “I think it’s dead,” and my daughter responded “Did it’s body stop working?”. Sarah was taken aback…and amused…and was able to answer the question without losing her cool. Listen to this episode – we’re all gonna need it at some point! Abdelnoor, A., & Hollins, S. (2004). The effect of childhood bereavement on secondary school performance. Educational Psychology in Practice 20(1), 43-54. Adams-Greenly, M., & & Moynihan, R.T. (1983). Helping the children of fatally ill parents. American Journal of Orthopsychiatry 53(2), 219-229. Ayers, T.S., Wolchik, S.A., Sandler, I.N., Twohey, J.L., Weyer, J.L, Padgett-Jones, D., Weiss, L., Cole, E., & Kriege, G. (2013-2014). The family bereavement program: Description of a theory-based prevention program for parentally-bereaved children and adolescents. Omega 68(4), 293-314. Baker, J.E., Sedney, M.A., & Gross, E. (1992). Psychological tasks for bereaved children. American Journal of Orthopsychiatry 62(1), 105-116. Berg. L., Rostila, M., & Hjern, A. (2016). Parental death during childhood and depression in young adults – a national cohort study. Journal of Child Psychology and Psychiatry 57(9), 1092-1098. Berg, L., Rostila, M., Saarela, J., & Hjern, A. (2014). Parental death during childhood and subsequent school performance. Pediatrics 133, 682-689. Bugge, K.E., Darbyshire, P., Rokholt, E.G., Haugstvedt, K.T.S., & Helseth, S. (2014). Young children’s grief: Parents’ understanding and coping. Death Studies 38, 36-43. Corr, C.A., & Balk, D.E. (2010). Children’s encounters with death, bereavement, and coping. New York, NY: Springer. Dyregrov, A. (2008). Grief in children: A handbook for adults (2nd Ed.). London, U.K.: Jessica Kingsley. Engarhos, P. (2012). The young child’s understanding of death: Early conversations and experiences with parents and caregivers. Unpublished doctoral dissertation. McGill University. Montreal, Canada. Kristensen, P., Dyregrov, A., Dyregrov, K., & Heir, T. (2016). Media exposure and prolonged grief: A study of bereaved parents and siblings after the 2011 Utoya Island terror attack. Psychological Trauma: Theory, Research, Practice, and Policy 8(6), 661-667. Renaud, S-J., Engarhos, P., Schleifer, M., & Talwar, V. (2015). Children’s earliest experiences with death: Circumstances, conversations, explanations, and parental satisfaction. Infant and Child Development 24, 157-174. Jen: 00:37 Good morning and welcome to today’s episode of the Your Parenting Mojo podcast. This episode comes to us courtesy of my good friend Sarah, who fortunately hasn’t yet had any reason to use this knowledge, but she asked me to do an episode on how to help children cope with illness, death, and grief, so she can be ready in case she ever needs it. So my guest today is Dr. Atle Dyregrov, who joins us today from Bergen, Norway, and he’s actually the first knighted interviewee on the show, so we’re going to refer to him as Sir Dyregrov. He’s also a professor at the University of Bergen, Norway. He graduated as a psychologist in 1980 and worked for five years in the pediatrics department at Haukeland University Hospital, helping families whose children had died. He also co-founded the Center for Crisis Psychology and served as General Manager for 25 years and he’s now it’s Academic Director. Jen: 01:29 He’s worked particularly extensively with children who have experienced loss and trauma as well as at the sites of major accidents and disasters, both in Norway and abroad, and has written numerous books, book chapters and research articles on children’s response to death and crises. Welcome Dr. Dyregrov. Dr. Dyregrov: 01:45 Thank you. Jen: 01:46 Thank you. It’s such a pleasure to have you here. Now. Before we get started on this topic, I just want to have a little word with my listeners because some of the episodes that I do on the show are episodes that I do for them and some of them are closer to my heart and this is one that’s a little closer to my heart as well. It’s not really a secret, but it hasn’t come up yet in the course of doing the show that my own mom died when I was 10. In a way that was both sudden and unexpected and it was so long ago now that it’s not really a difficult thing for me to talk about anymore, but I kind of wanted to make sure that people are aware of it because it does impact the way that I talk about death and also the way that I think about it. Jen: 02:20 I’ve lived with it for so long now that I sort of think I’ve earned the right to have a bit of a dark sense of humor. I also use very frank language like death and dead rather than passing or lost, and whenever someone uses the word lost, when they actually mean someone died. I always think of a quote from that fabulous Oscar Wilde play The Importance of Being Earnest, where Jack Worthington says, “I have lost both of my parents,” and Lady Bracknell responds: “To lose one parent, Mr. Worthington, may be regarded as a misfortune. To lose both looks like carelessness.” So our goal today is to try and understand what children understand about death and how they experience grief and to give you some real tools you can use when you need to talk with them about it. So let’s get started. All right, Dr. Dyregrov. I thought we could begin on Canada. Easier end of the questions and work our way towards the harder ones. So death is everywhere around us, you know, it happens to all of us and our media is absolutely saturated with it, but we have such a hard time talking about it and particularly talking about it with children. So I’m wondering if you can tell us your thoughts on why this is and is it really because we’re afraid of saying the wrong thing and should we be afraid of that? Dr. Dyregrov: 03:31 I think that’s part of the reason, but I also think that we are afraid of it because it has to do with our own vulnerability; the thought that maybe we will die away from our children to be left alone. That’s a hard thing for parents to think about and talk about. So it is a difficult topic for everyone. And I think it’s that some of the reasons for why we hesitate when we speak with children. Jen: 04:01 And it just seems so strange to me that it’s, I mean it’s everywhere on TV and we watch it all the time, but even when we’re not talking with children, it’s such a taboo topic. Dr. Dyregrov: 04:14 Yeah. But it’s getting gradually better, I think it said when I started in the field in the early eighties, children were not allowed into the hospital if there was a sibling who was very ill, are much more open about it now than we were and that happens everywhere. But, but it’s been a general movement across the world that we are more open with more direct and our responses to children. So I think we’re on the right way. Jen: 04:46 Okay. Well that’s, that’s a good sign then. So I’m curious about what children understand about death. We were actually.. I was taking my daughter down to the car this morning so she could head off to daycare and she was talking about how the rosebuds on our tree outside our house had died. And I was curious about what her conception is of that. Does she know that dying is forever? Does she know they’re not going to come back into bloom again in two weeks? What do children in general understand about death and what are some of the transitions they go through in this understanding as they get older? Dr. Dyregrov: 05:19 Well, in the preschool age, they have a problem understanding that when we’re dead, it’s irreversible; they can’t turn it back. They will ask you, well, in 14 days he’d be back! They also have difficulties understanding that all life functions cease when we die and they don’t understand that death is universal, that everyone will die. Sometimes depending on their actual experience, there is a transition when they get towards between four and six years, usually they would grasp more of this. My own son was…my youngest son was four and a half when his best friend and her and his sister were killed in a traffic accident as well as the mother and when we were going, and I took him to also see the three dead ones then, and before he saw them, he was saying that in 14 days he’d be back; after the summer, he’d be back. Dr. Dyregrov: 06:18 He was sort of not grasping their irreversibility of it, and then when we had seen them and he had taken into concrete facts on the way back home, he said that now we can never do this, now we can never do this. So he sort of took a step because of his practical experience with death and you see that in many children, that they gradually come to grasp with this and they understand that when we’re dead we don’t think, and the hair doesn’t grow any longer but it depends on how much you’re exposed to death also. Jen: 06:56 So you talked about the irreversibility there and then also the body is still a functioning after death. So it would be pretty common then to think that someone might have been buried but still be breathing or something in a way. Dr. Dyregrov: 07:09 Yes, that’s exactly what happens. They wonder who will give a person water; what if they’re thirsty? So they have this sense that they go on living and they would feel pain. So when we explain. We have to be very concrete that might make them understand how the death is concrete than that we don’t feel anything and we don’t need the supplies we usually would have as persons. Jen: 07:34 Okay. And so I, I know you wrote a book on this topic, it’s called Grief and Children: A Handbook for Adults and I found it very clearly written; the language is so concrete and it was so helpful to me in understanding ways to talk about this and you say in it that you should…or the parents should let the child experience the death in the same way that the family does and if there is a viewing of the body that the children should be allowed to see the body if they want to. That to me seems…I mean my mom was cremated so I didn’t have that option, but I’m just thinking about, you know, taking my three year old to see a body and it’s a very strange feeling for me and I’m not saying I wouldn’t do it, but it does feel strange. Dr. Dyregrov: 08:15 It does, but we’ve changed the culture in Norway when we started out, it was very uncommon to have children even participating in the funeral now children are included in rituals and we’ve also done a study where we’ve interviewed children about this and they say that children should not be left out. That should be part of this. And they argue for why it’s important for them because this is something you cannot undo later. It is something that helps them understand that death is real. It can contract the fantasies they have about what death is and it is also an opportunity for expressing. They can bring into the coffin, drawings; they can have written a farewell letter. And I’ve lots of practical experience with this now, and of course there’s been some children who struggled with the image, they see the dead person and it’s different than they thought it would be, so, so that create, can create a sort of, a traumatic image for them, but we can always help with that. But it’s very hard if a child who’s eight asks, where were I; did I get the chance to see? And we have to say no and we cannot undo that they’ve been kept out of this. So I really tell parents that the best thing is to include them, but I also say never force them. Parents must also feel comfortable with bringing the children along and it demands that adults prepare them, that they follow them through and give them explanations for what they see for also the adults’ reactions they may observe and then follow up afterwards with conversation about what they’ve been part of. Jen: 10:07 Yeah. It seems that that preparation is really key, right? I mean, if you don’t know what you’re going to see. And I, I’m actually not sure I’ve ever seen a dead body, so I don’t know how I would prepare someone, but I assume there are people you can talk to about that kind of thing. Um, and that you should have a conversation with the child in advance, right? About what they’re going to see. Dr. Dyregrov: 10:25 Definitely. It’s, it’s the difference between something that can be experienced traumatic, and what can be therapeutic for you lies in the preparation. Jen: 10:35 Okay. And so do you find that funeral homes are typically well equipped to have those kinds of conversations or how do you do it if you don’t feel comfortable doing it yourself? Dr. Dyregrov: 10:45 In Norway we see that the, I don’t know what it’s called, the funeral and the undertaker? Jen: 10:51 Yeah; same thing. Dr. Dyregrov: 10:52 They are the ones that often introduce this to the families and also try to get the parents to include children. And so it’s more the rule that children will be part than they are excluded. And the same… If there’s damage to the body due to accidents or suicide, they will. If parents can’t be that children shouldn’t be there, but when parents can be there, children can be, and I have helped some who struggled with images, but it’s very few compared to how many will take part in this, but there are cultural differences here and it’s something that you gradually have to be in a culture get used to, I think and find ways of doing it within the culture you live in. Jen: 11:43 Yeah. Yeah. I’m just thinking about. We often talk on this show about how what other people do in other cultures is different and you mentioned that the culture is shifting, and particularly in Norway, and a lot of it has to do with the amount of experience that children have with death. And I’m just thinking, you know, in cultures where they’re not as lucky as us to have as much access to advanced medicine and death must be a very much more common experience that children must have a greater understanding of what it means to be dead at a very much younger age than they do in Western cultures. Do you think that’s right? Dr. Dyregrov: 12:21 I think so. But we had a disaster some years ago we had 17 people were killed in a boat that capsized, and most of the families were from the Philippines and we had 50 relatives or let’s say it was mostly parents and the close family, not children that came up to Norway and before they were returning home we had a discussion about how they could prepare, how they could talk to the children at home and they came from a culture where they said that it was not usual to include the children, but when we discussed they understand stood the rationale all behind this. They understood how this could be important for children. So I’m quite sure that they would include the children in viewing the bodies after they had that conversation. Jen: 13:09 Okay. All right. So we’ve been using some pretty concrete language here about death and dying and bodies and that kind of thing, and I think it can be difficult to use that kind of concrete language with children rather than lapsing into the euphemisms of people passing and getting “lost”, which is always my favorite one. How should parents who are religious balance their explanations that are, that are based in their religion with concrete terms and even parents who aren’t religious, how can, how can we sort of get beyond those euphemisms to terms that really makes sense to children? Dr. Dyregrov: 13:42 I think it’s important that we can have… It’s possible to describe it in very concrete terms and what death is and at the same time, if you’re in the family that’s religious, it’s okay to.. they already introduced heaven, I guess, and then it’s quite possible to also say that the body is in the coffin but we think that the soul leaves the coffin and goes up to heaven. So you describe that. That’s what we believe. And then I wrote a book about this where I just put in a one explanation for those who are religious and one for those who are not. And it isn’t a great problem. It is a problem if we only bring in as a relief for them, the abstract because they have difficulties understanding the abstract. One of the first children’s drawings I got was from a four year old who observed when her younger sibling was killed in a traffic accident and she drew this so beautiful is she drew the, the coffee with the dead child in it and two hearts, one heart that resided in the coffin and one on its way to heaven. And it was just so beautiful and she had taken in both parts of this and children have…if this is something that children have the possibility of taking that belief in too and it’s good for them. Most children, even if they’re not religious will think that they’re there somewhere and we can visit them. There was one study in from, from England where they ask children about their belief in the afterlife and the author from England said that most children were a bit confused because they had only heard about people going up to heaven. But no-one coming out. So it must be very crowded up there. Jen: 15:42 Nice. And I guess related to that, it seems as though if we tell a child that somebody is sleeping or that they’ve gone away on a long journey, that that has enormous potential for confusion and that the child might think the person’s coming back. Dr. Dyregrov: 15:59 Yeah. That’s that’s the worst thing we can do. And you have children who will, if the parents take a nap, they will be, can be very, almost panicky that they are sleeping because I think now they will die too. And, and of course the most common reaction and children when there’s a death in the family, is that the fearful that this would happen to others too. So when you increase that fear, you’re doing a misservice to the child. Jen: 16:27 Is it more common for a child to be afraid for somebody else to die or for themselves to die? Dr. Dyregrov: 16:33 Somebody else. Usually for children, if they’ve lost one parent, it’s the other parent. And if it’s a sibling, it’s the same. It’s not that usual that they start fearing for their life, but some, some do. I had one boy whose father died of a brain tumor and he was certain that he had a brain tumor as well. So health anxiety can develop. Jen: 16:57 Okay. All right. 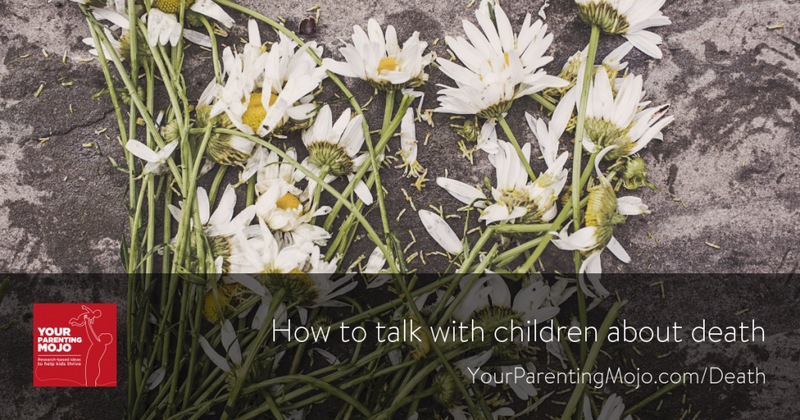 So I want to start talking about some kind of, some examples of how these kinds of situations might come up where parents need to talk with their children about death and how we can do that in really specific terms. So you know, our media is preoccupied with death and so our children’s first experience with death might be hearing about it on the TV or on the radio or maybe even killing people in a video game. And I know that you’ve worked a lot with children who have directly experienced crises both in Norway and elsewhere. But I’m also thinking about children who don’t experience them directly but just see them on TV, you know, in the US, obviously the planes flying into the world. Trade centers are really obvious example that really severely impacted children in America. And so I’m curious about the kinds of questions that children ask about people whom they don’t know who have died, and parents should say in response. Dr. Dyregrov: 17:51 I think also here, that it needs to be an explanation that’s concrete that when they ask questions and they will, for example, think did they feel any pain before they died? Then they’ll ask, how long did it take? Some of the same questions that adults have. But I think we need to, for example now with terror, I’ve written a written guideline for parents on how to explain terror for children and that they need some concept that needs some pegs to put her on their sort of understanding of the world. And so it has to be near to what happens and parents must not try to explain away what has happened. It must be concrete terms and they have to go by the questions that the children ask. But they can be so incredibly different. It’s easier to explain and it’s easier to talk when it’s not happening to your own family. So that’s a good introduction. A pet’s death or somebody else that dies, that’s not affecting the child directly is a good example of how you can introduce and talk with them about death and explaining that to them. Jen: 19:05 And so just to talk a little bit more about something you said, you, you said you wrote a guide to talking with children about terror. What kinds of things are in that and can we please get a link to it in our references? Dr. Dyregrov: 19:17 It’s trying to explain how people can do a thing like that. Now we had in Europe, we’ve just had the London terror and the Manchester terror, so we’ve will be writing these guidelines every time there’s a death or several deaths that’s very much in the media. And we tried to explain by saying for example, that in most people have a cleaning machine in the brain that when you have thoughts about doing something that’s not right, this the brakes and the cleaning machine would take away these thoughts. But sometimes with the terrorists, they don’t have that, that barrier. They don’t have these things that will clean the thoughts, so they develop often by speaking only to others who think the same ideas that can make them do it. So it’s an explanation of that in the terrorism for sort of the cognitive aspects of it. So we’re very concrete also in the way we we say that they can try to to get close to the child because the child, as you say, they take in so much of this news. We also know that the more time they spend watching the news, the more this will affect them even when they’re not directly hit themselves. Jen: 20:32 So does that mean that there are so many of these incidents going on these days that that has a cumulative effect? Or is it more that when a big one hits close to home that it’s watching you know, 20 hours of TV on that specific topic that’s, that’s harder. Is there one or the other that’s worse for the child’s outcomes? Dr. Dyregrov: 20:50 It’s both. Because we have to think that these very dramatic incidents that we see on the in the media happens more often than they do. The chance of getting killed in terror is extremely low in Europe. In Norway in the last five years, we have not had a single child that’s been killed in terror and we’ve had about 200, 250 deaths from accidents and other things and so we are afraid of the wrong things. Also in the US, the shootings, it’s not the terrorist, that kill people. So, so this is, but the brain is wired to be anxious for the things we see that get so much attention in the media. Jen: 21:31 Okay. Alright. So you alluded to this already about a child’s first direct experience with death might be related to an animal. Maybe it’s a wild animal that they see…I was actually talking to a friend of mine the other day who saw a dead bird on the street and told her five year old about it and the five year old was absolutely distraught and drew a picture of the dead bird and the Mama bird being so sad that the dead bird was not coming back, but it may also be a pet and pets can be extremely beneficial in children’s lives and they can help children develop pro-social skills and improve physical health outcomes, but eventually they do die and the child might have become very attached to that pet by that time. And so I’m wondering if there are things that the parent can do to prepare the child for that if it seems like it’s getting to that point if the animals just getting old and also how that differs from what happens if the pet dies suddenly while the child’s away. Dr. Dyregrov: 22:24 When you have either in in pets or in people something that you know will happen, most of the children don’t want to go around thinking about it all the time, but they need to be prepared. Actually in in the Scandinavian countries, we now have a law that says that if you have a parent who’s ill, the child has a right to be informed along the way; it’s ruled into the law, because that has to do with mental preparation, but it’s difficult. I have one girl now who’s 13 and her mother has a serious illness and she will die; we know that, but she doesn’t want to think about it. So some children don’t want to have that information that they have right to have because they’re the coping by just pushing it away, but others don’t get the information they need to process and they want more information. Dr. Dyregrov: 23:17 So. So we need to be tailoring what we do to the individual child. But mostly it’s good to know when there’s a situation where the pets or a person that now it’s changed. Now we know that even though we can’t know the exact date for when the death will occur, we need to prepare them, but children are… They don’t have a large sadness [unintelligible]. So they will get the information and then can say, okay, can I go out and play now? And that’s so wonderful because this has to do with the way they regulate emotions. Through childhood we gradually develop the skills of emotional regulation and to regulate emotions when they get so strong as they do what does there’s death you need to be fairly old before you have that capacity. So then they down regulate their emotions by doing ordinary things and the problem with that is of course that adults then think “now it’s out of sight, out of mind,” while the next minute they can be very sad because then they think about it. Then it’s often in the evening that these thoughts enter the mind when you you have less control over your thoughts. Jen: 24:31 And so I’m just thinking about this from a parent’s perspective. What might happen then is if we had a cat and told my daughter the cat had died and she might appear sad for a minute and then say, you know, I want to go and play now and that might be very strange for me as a parent to think, does she not care about the cat? But I assume that’s no indication of how much she cares about the cat? Dr. Dyregrov: 24:54 It’s not. And if you get to adolescence, you see that many of the adolescents just push away and they get. That’s a lot of concern among parents about this. So I have a boy who is 13 years old; he has lost his father and he doesn’t want to talk about it. And that’s problematic because sometimes it is a reason for concern but often they can function without talking so much. If they continue to function and they are out with friends doing fine, there’s no need for concern. But if you see that their functionality goes down and this really is taking a toll on their friendships, then you need of course to do something about it. But it’s hard because I work a lot with adolescents and many of them cope well, even though they push things away and you cannot start any kind of therapy and before they’re ready for it. And so some of them then come back when they’re in their twenties and then they need to open up the feeling channels again because they’re entering a relationship with them where that’s needed. Jen: 25:59 Okay. Wow. That’s a lot of potential years of sort of not dealing with it. Dr. Dyregrov: 26:04 Yeah. But they are functioning and they’re doing fine. But when you are in a relationship, you often need an ability to be more close to your emotions and you need to open up what you may have had good reason to push away for, for a long while. Jen: 26:23 Okay. And so as we sort of move up our hierarchy of severity of death and potential trauma to the child, um, it seems as though the next level of trauma related to death, Once you sort of moved beyond pets and animals, comes with someone whom the child is really close to, but maybe isn’t the child’s primary caregiver. I’m thinking it might be a grandparent or a friend at school or maybe a teacher. Do children’s reactions to death change as the quote unquote importance of the person in their lives increases? Dr. Dyregrov: 26:59 Yes. It has to do with how much time you spend with somebody, so if you have a grandparent who takes care of the child a lot. Of course the reactions would be stronger than if it’s somebody you see now and then and that’s the same with friendships. One of the things that we have underestimated is the effect of losing a close friend. We’ve done some studies in this and we did one after the terror we had in Norway in 2011, which shows that the grief in close friends were on the same level as siblings, so we need to understand that more. Of course friendships, especially in the adolescent years are even more important in some ways than our relationship with parents. Jen: 27:42 No, that’s not true. Parents are always the most important. Dr. Dyregrov: 27:50 If you see the reactions in adolescents, they are very strong to losing the closest friends. I have had several in also in follow up following that, but I agree with you, of course. But it depends on the relationship to the parents. Grief over a parent is not always straightforward. Some have difficulties, but might be somebody who has been neglecting them or beating them or be an alcoholic. So it’s not like every time there’s a positive relationship that they’ve lost. Jen: 28:25 Okay. And so when, when the person who died is close to the child, is that person is probably also somewhat close to the parent as well depending on whether it was a teacher or a grandparent. And so I’m curious about how parents can balance their own needs as they’re going through a grieving process themselves with their child’s needs as well. Dr. Dyregrov: 28:47 And that that is a problem because parental capacity is reduced if you have a death in the family. Of course this is, especially if you lose your partner or in the family that’s a child who dies, it can be very, very powerful for the rest of the family. And for example, I had a boy who, 14 year and a half years old, his brother was actually shot and killed and two years later he came back to me and he was really depressed and sad and he said that it should have been me. My brother was so successful, if they had lost me, it would be easier for my parents. And I had to say to him that usually parents, this has not nothing to do with you not being as they are, they not being as much in love with you or loving you as much it has to do with how a death is almost like a one of these dark holes in the atmosphere that draw their attention to them. So he needed that psychoeducational guidance that the understanding that that’s not how we usually the parents function, but it has to do with death is so overpowering for parents happens to a child. Jen: 30:03 Yeah. And I could imagine that it could sort of go both ways if the parent is sort of consumed with their own grief that the child’s needs might get neglected. But on the flip side, if the parent becomes consumed with the child’s needs, the parents’ own needs could get neglected, what’s the balance there? How do you find that balance? Dr. Dyregrov: 30:22 The parents who are able to sustain the conversation about the last one is really the parents who do the service of the child and. what the child needs. The child is in development. That means that the way you think about the death when you’re seven is different from when you’re 11 and you need adults to talk along the way to help you expand your understanding of death to help you explore what that person meant for you and if the adults also hit themselves by did that they cannot sustain these conversations, they cannot have an elaborate conversation with a child, it’s much more difficult for the job and it’s also very much information… The more sudden death is, the more information often is kept away from the child and for the child to understand as well as to process emotionally what happens. It need both saying it needs to information to understand it needs to build a structure and their experience along a timeline and that is very difficult if the parents don’t allow them in on what has happened and also informed them over new facts that can come fairly long after the event where they get some information; the report from the accident. It might be an autopsy report. So here is why I’m very eager for adults to be open for that information. Jen: 31:52 Okay. And so I’m just thinking about how we can know that we’re kind of getting that balance right at whatever age our child is. And so what I’m thinking through in my mind is if the child is asking questions then they are probably processing it in their own mind and if we’re able to answer those questions in a direct and honest way, then then we’re probably giving the child the information they need to continue processing it. And if that is kind of ongoing and you know, maybe different questions come up over time, is that a good way of thinking about, okay, everything’s probably going as it should in the processing of this death with this child. Dr. Dyregrov: 33:57 That is a good indication how they’re doing. As soon as they start to fall out and sort of isolate themselves sitting alone at home, withdraw from friends,then that’s a sign that maybe you should at least try to talk with them. And sometimes refer them too. One thing I would like to add is that if the death is sudden, there is also the aspect of trauma in this and if they have traumatic images that have experienced this in a traumatic way, that might be a barrier to the processing of grief. Because every time they are thinking about the lost one, they think about how it happened or what they saw or their fantasies about what happened and that makes them just try to not think about it, not talk about it. So it’s important to know what, how are they dealing with traumatic aspects of a death. Jen: 34:55 And I imagine that could be traumatic for the parent as well to think about that. Could the parent have somebody else talk to the child about it, like another family member or…? Dr. Dyregrov: 35:07 Yeah, that’s no problem at all, but, but you just need to… If they start sleeping very poorly, it often it’s because these images of fantasies enter when they go to bed. Like to give you an example, I had a father who dropped down with a heart attack at home and there were two children, 11 and 12 present. And they were sent out of the room when the ambulance people came. And afterwards, the mother a couple of weeks later said that…I think it was three weeks late, and she said that they cannot sleep. And I asked her to bring them along and it turned out that there was a window in the door into where they were working with the father and they used of course electric stimulation to the heart and he jumped and they both had these images on the mind and the mother’s attention was of course on the husband, so she didn’t know that they had seen this. And as soon as we had that on the table, it was possible for them to get help with these images so they could go further with their grief because the trauma was really affecting how they were functioning. Jen: 36:15 Yep. Yeah, that makes sense. So we’re sort of getting to the final level of traumatic death related to having a parent die. And I think it was probably less traumatic for me than for many children because I wasn’t close to my mother for a variety of reasons. But for very young children I would think it raises really basic questions about the child’s own safety and security and whether the other parent is going to be around for them. So what kind of reactions should we expect to see in children as they process that information and how can the remaining parent and the other family and community support them in that. Dr. Dyregrov: 36:49 Small children often have separation anxiety. When they’re a bit older you see the same, but then they can verbalize some of this. There’s a variety of reactions they can have from no reactions at all, to many different reactions. The guilt feelings that they have doesn’t need any kind of reality to it, but they still can… Like give you an example, I had a seven year old whose mother tried to commit suicide by throwing herself from a ferry and she didn’t succeed but she lived for four years without any contact with her. And then she died and I met her when she was 11 and asked if she remembered this. And she said I remember it very well. And I also remember I thought she did it because I hadn’t tiedied up my room. Now then you have 11 year old reflect on the imagined guilt at seven. So there’s these different reactions that we need to as adults to touch in a way, so we need to talk with them and we also need to help the process along the way when they start reflecting on it and might be bothered years later by something or like her who were then made sure enough to see that there’s that thinking was faulty. Jen: 38:09 Yeah. I mean, wow. Having traveled through life for so many years thinking that you are responsible for your parent’s death because you didn’t tie to your room. Is that really common in young children? Dr. Dyregrov: 38:20 The guilt feelings are common. I mean I had one that was 20 years old. She was three year sold when a younger sibling was at home and then she had problems and was on one of these alarm mattresses. Well actually she was out of the home that day and the mother was there; she saw that she had stopped breathing, but the alarm had gone off when she was showering. And when the girl came home she had thought had I been at home, this would not have happened. She didn’t die that she died at the hospital later, but that had lived in her until I met her at 20 and it was all faulty thinking and no adult had ever touched it. It was the problem when she was 20 that that led to us finding out that this was actually the the course of it, so there’s a lot of these guilt feelings that have no basis in reality that may be there among children, so we really should be, especially if the child seems to be not functioning as well as in school, or is very much alone. I think that that is a possibility at least, but anxiety, guilt, anger, boys and girls can get very angry afterwards and these are normal reactions, but if they continue over time, especially over six months, it’s something that we need to address and they need to get some help from it. Jen: 39:49 Okay. That’s a very helpful guideline and also it seems as though the topic of guilt that is misplaced is something that can be very easily addressed in a conversation and if the. If the child felt comfortable saying that to somebody, do they ever feel comfortable saying, I believe that I caused my parents to die because I didn’t tidy my room when they are, you know, five, six, seven or is it something that they just never say to anyone no matter how much another family member asks? Dr. Dyregrov: 40:19 No, they can say it. I mean, I’ve had those who have said that, no, it’s my fault. Then when you start talking with them, they can say, you only say that because you want me to not think that way. So that can be fairly abstract or, or keeping onto that thought. So it’s sometimes hard to, to try to get to the core of that guilt feeling because it’s emotion-based more than it’s fact-based. Jen: 40:48 So is there something that parents or therapists or somebody else could do if you know that that is an issue and the parent’s death was not caused by the child, not tidying the room, is there any way to transition that from being emotion based to being fact based and helping them to understand that they were not responsible? Dr. Dyregrov: 41:04 Good information when reduced guilt feelings, but also when.you have a… I don’t know if you know, this is things that they used to get asphalt to make concrete to smother it. I say some things that I have to go up in your brain and help getting your thoughts to be different because you’re only thinking in one way. So we sort of attack some of these thoughts, the child and myself together when they really are stuck in these thoughts and gradually get movement; they are sometimes very rigid. But in most children it’s not very rigid so it’s possible to do something. The best thing we do is good explanation, close to death. Having parents being aware that children were very easily can say that it was my fault. So if parents early say that there’s nothing you have done or said that has anything to do with what happened, it cannot produce what happened. So that’s something we should have her almost like a routine when you have children in relation to death. Dr. Dyregrov: 42:39 I had three children, twelve year olds who were witnessing… And they were playing in a new site where that shouldn’t have been. The adults should have kept them from being in a building site. And one of them, he a trod on a stone that fell on ta bigger stone that hit the brother of one of these children and a five and a half year old was killed instantly. And it was so good when the others at once said that it was our responsibility to have prevented people from entering that it has nothing to do with you set that stone down there, and he said it when we met a couple of days afterwards that it was very good that the adults said that otherwise I would have thought it was my fault alone. And he also got that from the ambulance people who came. They were so supportive. They were saying this is adults’ responsibility and it helped him tremendously. Jen: 43:36 Okay. You’ve given us so many concrete examples. I wonder if I could ask you a personal question. You’ve studied this for so many years with so many different people. How do you cope with what I imagined her are complicated feelings about death? Dr. Dyregrov: 44:27 Well I have two children who are journalists; one of them as a TV anchor in the news. So we get a lot of very interestings conversations when we all get together. I also lost mother as a 19 year old, so that made me interested in this theme because there was so total lack of help for families that situation. She had cancer; we never communicated about it. My father didn’t want her to know who didn’t allow us to say that we knew. So I thought, this is not right. And then I had a wonderful mentor who brought me into the area as a student to working with the children with cancer. And so it’s been a lifelong, I won’t say obsession, but it’s something that I really have wanted to make a difference by writing in this area. Jen: 45:19 Yeah. Well, I hope you will touch a lot of people with this today. Thank you so much for sharing your thoughts and your time with us. I personally have tools that I am stashing away in the back of my my tool chest and hope that I won’t have to use for a while, but I know that they’re there if I need them in that field. That’s a very good feeling to have, so thank you. Dr. Dyregrov: 45:36 And thank you for letting me be part of this. Jen: 45:39 So I just want to remind listeners that references for the show today can be found at YourParentingMojo.com/death and Sir Dyregrov’s book Grief in Children: A Handbook for Adults is available on Amazon.